^ 1.0 1.1 Allison, Christine. Yazidis i: General. Encyclopædia Iranica. 2004-02-20 [August 20, 2010]. There are probably some 200,000–300,000 Yazidis worldwide. ^ Yezidi. Adherents.com. [2008-03-31]. Cites estimates between 100,000 and 700,000. ^ Deadly Iraq sect attacks kill 200. BBC News. 2007-08-15 [2008-03-31]. ^ Yazidi in Syria Between acceptance and marginalization (PDF). KurdWatch. kurdwatch.org: 4. [1 April 2014]. ^ Andrea Glioti. Yazidis Benefit From Kurdish Gains in Northeast Syria. al-monitor. 18 October 2013 [1 April 2014]. （原始内容存档于2014-02-19）. ^ Всероссийская перепись населения 2010 г. Национальный состав населения Российской Федерации. Demoscope. Demoscope. [26 October 2013]. 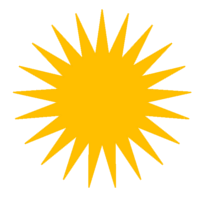 ^ Son 377 Yezidi kaldı - Hürriyet. Hurriyet.com.tr. [2014-08-13]. ^ Irakisk politiker: Vi har kun få dage til at forhindre massedød på bjerg. Politiken. [9 August 2014] （丹麦语）. ^ Nebehay, Stephanie. Islamic State committing genocide against Yazidis: U.N.. Reuters (Geneva). 2016-06-16 [2016-06-16]. ^ Weltorganisation der Zoroaster: "Êzîden sind keine Zoroastrier" – Interview mit êzîdîPress – ÊzîdîPress. ezidipress.com. [17 December 2015]. ^ Zarathustra-Statue als Geschenk für Êzîden in Efrîn – ÊzîdîPress. ezidipress.com. [17 December 2015]. ^ Qewl-Fälschungen. ezidipress.com. [17 December 2015]. ^ 3萬雅茲迪人逃出　揭伊斯蘭國暴行　聖戰分子殺500人活埋婦孺. hk.apple.nextmedia.com. 2014-08-11.